This wonderful little perennial has an enduring popularity in British gardens, the neat little clumps of aromatic grey-green foliage supports a profusion of flower stems clothed with Lavender blue flowers that are adored by bees. The flowers appear from late May right through until the autumn making Nepeta an excellent companion to Roses, they are a good plant for lining paths where the cascade of foliage and flowers will soften edges and fill the air with their aroma, particularly when crushed by passing feet. Best in full sun, prefers well drained soil. 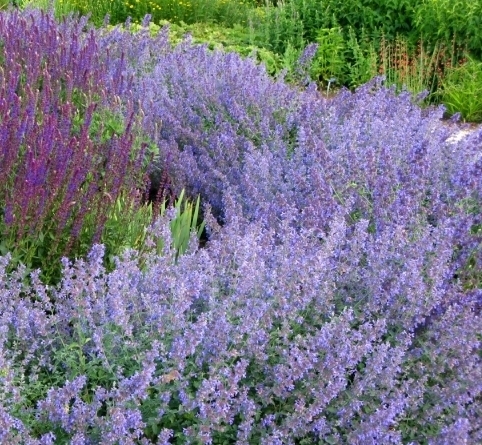 Versatile hardy perennials with aromatic grey foliage and a succession of blue flowers throughout the summer and autumn. They make excellent ground cover in any well drained soil, especially around Roses. Cut to ground level in spring. Grows to 45cms. Planting distances are very much a matter of personal choice and budget but as a rough guide 4 plants per sq. metre is adequate if you are patient, 6 per sq. metre will give better coverage while 9-12 plants per sq. metre will make a weed suppressing carpet quickly.